Disclosure: Our food was covered by Chef Michael’s and The Florida Keys. All opinions are my own. 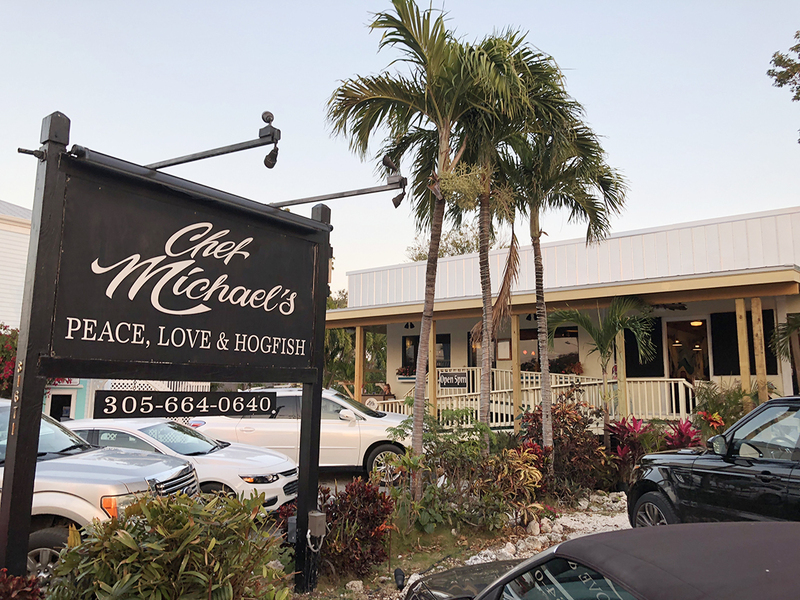 Located at mile marker 81.6 oceanside, Chef Michael’s offers it’s diners dock to dish fresh seafood, prime steak, smiling service, fine wine, and craft beer! I have to say, after eating at Chef Michael’s, it was one of the best restaurant experiences I have ever had. The food was perfectly cooked and tasted great, the service was perfect, and the atmosphere was reading. During our dinner, the restaurant was quite full. We did not feel rushed at all, and our food and drinks came out in a very acceptable time. A I mentioned earlier, the food we had at Chef Michael’s was perfect. There is no other way to describe it. Everything was delicious, and made me have that look on my face when I just took a bite out of the best food I ever had. Ya, that face. I say appetizers, because we had a few, and shared amongst the group. Like a hushpuppy, these delicious deep fried fritters had a blend of conch and crawfish, with a crispy outside. Perfect with the paired Aoili dipping sauce. Lobster is delicious, but it is a lot of work breaking through that shell. This appetizer had the lobster removed from the shell, coated in tempura, deep fried, and paired with a mouth watering coconut Thai red curry sauce. It was incredible! As this guy is pretty much despised in the ocean, local chefs were encouraged to have them caught and put them on their menus as a way to eradicate them from the Florida Keys area. We had to do our part to help, so we ordered one to share. The meat was tasty, and it made for a great conversation piece. This pasta jumped at me on the menu, but I really love marinara sauce, so I asked them to substitute marinara for the oven roasted tomato and basil cream sauce. Shrimp, scallops, and lobster, over a delicious pasta. It was amazing, and I had enough leftovers for a late night snack. In what has clearly become the best slice of Key Lime Pie I have ever tasted, this dessert was tart, perfectly prepared and presented, and left me wanting the rest of the pie. Trust me when I say that if I would have still had room left, I would have ordered a second slice. And possibly a third. There is something on the menu at Chef Michael’s to please everyone’s palette. The fish selection portion of the menu changes daily. • Lamb Shank: Braised in Castronovo Red, garlic and rosemary, smashed potato. • Peppered Prime NY Strip Steak 16oz. : Pinot Noir sauce, and frizzled onions. • Seafood Pasta: Shrimp, scallops, and lobster, oven roasted tomato and basil cream. • Crispy Roast Long Island Duck: mango, Mandarin, and cashew sauce. • Filet Mignon 10oz. : Crispy fried spinach, Sauce Béarnaise, and Taters. • Simply Vegetarian: A creative, healthy plate of the day’s veggies, grains, and spice. • Key Lime Pie: with whipped cream, strawberries, and strawberry coulis. • Salted Caramel Cheesecake with Creme Brûlée Topping: with whipped cream, and strawberries. Open daily from 5:00pm to 10:00pm. Sunday “Nearly Famous” Brunch from 10:00am to 2:00pm. You can keep up with Chef Michael’s posts on Facebook. Mmmm. ..key lime pie!! I had no idea you could eat lionfish. The tempura Florida lobster tail look amazing! Sounds totally amazing! So many of these foods I’ve never even tasted, like crawfish and conch. I’m a little embarrassed to say I’ve never tasted Key Lime Pie either. I need to live a little. I enjoyed this post. I’ve never seen or heard of a lionfish before! Looks a little creepy but I would give it a try!